The biscuit roll, crispy biscuit roll, crisp biscuit roll, cookie roll or love letter is a type of biscuit snack commonly found in many parts of Asia. It is crunchy and can be easily broken into pieces. The Chinese name for this snack, "蛋卷," can be directly translated into English as "egg roll." However, the food item known in the west as egg roll is very different. In Hong Kong, biscuit rolls are made of wheat flour, butter, egg, sugar, and vanilla flavour. The New Territories is one of the places that manufacturers biscuit rolls. It is called barquillos in the Philippines and is commonly sold in souvenir shops or delicacy stores all over towns, cities, and highways along the provinces. 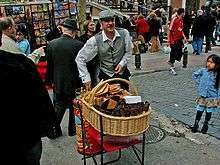 They are also found in Spain with the name barquillos, and in Madrid they're commonly sold by street vendors dressed in the traditional "chulapo" regional attire. Wikimedia Commons has media related to Barquillos. ↑ Mijune (30 May 2010). "Best Egg Rolls". Follow Me Foodie. Retrieved 11 August 2012.